Bangtan Boys, also known as BTS, have swept major music charts across the globe with their new album, which was released worldwide simultaneously on Friday. The album, "Map of the Soul: Persona," topped the iTunes album chart in 86 countries including Brazil, Canada, India, Japan and the U.S., while its lead track, "Boy with Luv," topped the singles chart in 67 countries. The song's music video garnered 100 million views on YouTube at the fastest pace, just 37 hours and 37 minutes after it became available. 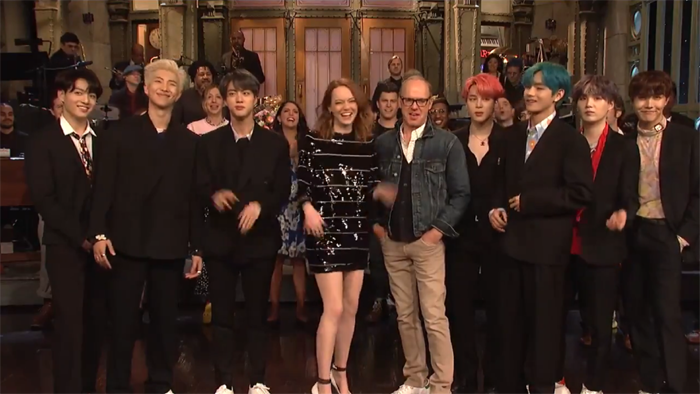 Bangtan Boys pose with actors Emma Stone (4th from left) and Michael Keaton (next to Stone) on the stage of "Saturday Night Live" on Saturday in this grab from NBC. "The spotlight [of the show] belonged to the seven members of the boy band sensation," CNN said Sunday. "The group's high-energy dance moves and pitch-perfect vocals as they performed 'Boy with Luv' and 'Mic Drop,' drew screams and applause from the 'SNL' audience and lit up social media," it added. "Expectations were high, and the group absolutely slayed it with the first televised performance of their newly-released single," Billboard said. The phenomenal popularity of BTS paralyzed Korean online music sites as well. The mobile app and website for Korea's biggest music streaming service Melon went down temporarily for an hour and 45 minutes as traffic soared upon the release of the BTS album. The service's operator Kakao M said, "We prepared for a sudden increase in traffic but it spiked way beyond our estimate."